We are delighted to be hosting this year’s conference at the Wyndham Grand Pittsburgh Downtown, Website: https://www.wyndhamhotels.com/wyndham-grand/pittsburgh-pennsylvania/wyndham-grand-pittsburgh-downtown/services-amenities, located at 600 Commonwealth Place, Pittsburgh, PA 15222, telephone: 412-391-4600. 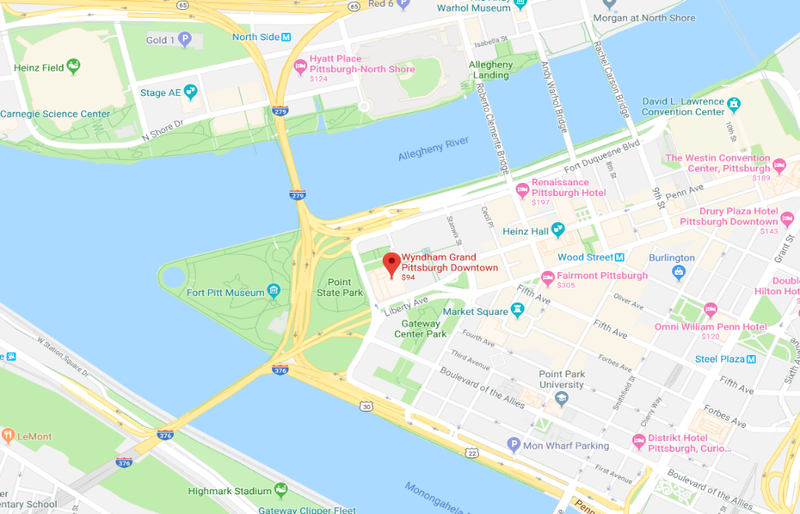 The Wyndham Grand is within sight of Point State Park, where Pittsburgh’s famed three rivers meet, and is within walking distance of all of Pittsburgh’s major sports and entertainment venues, the Cultural District, and endless dining and shopping experiences. Key amenities offered by Wyndham Grand include free shuttles to local attractions, WiFi, an indoor pool, and a restaurant and bar. The conference rate is $129.00 per night (plus taxes and fees). The block of rooms at this rate extends from September 3rd through September 15th 2019. Reservations must be made prior to August 6, 2019. The rate for qualifying state and federal government employees will be the prevailing government per diem rate (Federal GSA Rate). Reservations in our reserved block of rooms are being accepted now and can be made by following this link: https://book.passkey.com/event/49546923/owner/2945954/home. Cancellations made within 24 hours prior to arrival will forfeit one night’s room and tax. Take I-79S, merge onto I-279 S to Pittsburgh. Exit 1A on left to Ft. Duquesne Boulevard. Turn right at Stanwix Street. Stay right on Penn Avenue. Turn right on Commonwealth Place. Travel I-79N, merge to I-376 E via exit 59A to Pittsburgh. Exit 70A to Liberty Avenue. Turn left on Commonwealth Place. Take I-376W, exit 70D on left to Stanwix Street. Turn left at Ft. Pitt Boulevard. Turn right on Commonwealth Place. Take I-376 E, exit 70A to Liberty Avenue. Turn left on Commonwealth Place. Go North on Airport Blvd and bear slight left to exit Airport. Take I-376E towards Pittsburgh to I-279N. Exit at 70A for PPG Paints Arena and take Blvd of Allies / Liberty Avenue exit. Make left at end of ramp onto Commonwealth Place.